There’s a 79 percent chance some of the strains could infect humans. Someone didn’t wash their hands after using the space toilet. 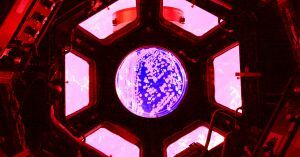 A recent survey of bacteria on board the International Space Station revealed five different strains of Enterobacter, a type of bacteria notorious for its ability to survive our strongest antibiotics. When scientists analyzed the genetic makeup of the antibiotic-resistant strains, according to research published Friday in the journal BMC Microbiology, they estimated a 79 percent chance that the bacteria could infect humans. The bacteria samples were collected for study back in 2015. The lack of off-world Enterobacter infections since then means that these strains are not immediately dangerous. But should they someday become dangerous, then options for treatment will be limited — especially if that day comes before doctors develop new types of antibiotics to prevent the impending crisis of new bugs that can withstand our antibiotics of last resort. The reason some experts aren’t certain how much of a threat these bacteria pose is that we don’t fully understand how bacteria operate in space, where there’s less gravity and more residual radiation. Should they start infecting astronauts, the ISS may become plagued with cases of lower respiratory infections and urinary tract infections, among other conditions caused by Enterobacter. Enterobacter is notorious for complicating people’s hospital stays. People with other conditions that weaken their immune systems are more susceptible to an Enterobacter infection, which is then very difficult to treat — and scrub out of hospitals altogether — because of the bacteria’s resilience. So while astronauts are safe for the foreseeable future, doctors will need to develop a game plan to make sure they stay that way, especially when faced with opportunistic bacteria that are hard enough to treat in earth-bound patients.